How to assess and develop your organization’s resilience. 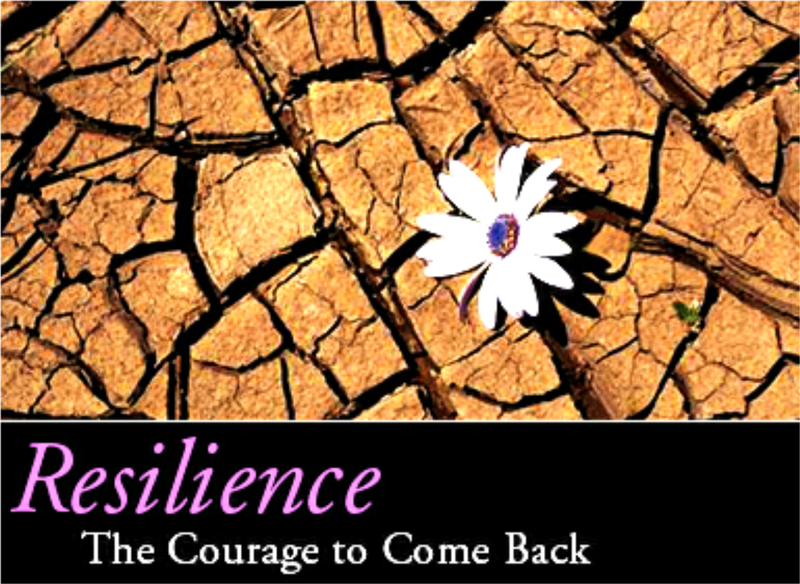 Resilience – a word more often abused than used correctly. Resilience often is used to describe strength. Although strength is implied in resilience, it is actually not a trait (a distinguishing quality) – rather it is a capability, something that can be used. Flexibility – how flexible is your business in terms of how it works, how it is structured and how it is organized in producing the same outcome result? Adaptability – how can you apply what you do and how you do it to produce different outcomes or results. Learning – how good is your business, at an individual and corporate level, in learning the lessons from having to adapt or be flexible so that you can avoid repeating them (hard , painful lessons) or you can leverage them in the future (where you have had success) and understanding why you were successful or not. Alternatives – are there many ways in which you can achieve the same result, or are you locked in to one or only a few ways? Interchangeable – how easy can different building blocks (people, assets, processes) be used in a different sequence and/or configuration to produce the same result or outcome? Reusability – can your core people, processes and assets be used to produce different outcomes and results with little or no difficulty? For example, a consulting firm can reuse many of its existing people, processes and assets in delivering a new service. However, the Boeing factory production line can only produce Boeing airplanes – it cannot produce other products without significant changes in people, assets and processes. Speed – how quickly can you move from producing one set of products and outcomes, to produce new products and outcomes? Capacity for Change – how prepared and able are your people to make the necessary changes? Measuring – how good are you at being able to quantify or qualify the changes that have occurred, their implications and the associated outcomes? Are you able to identify where the greatest impact, positive or negative, has been realized? Applying – can you clearly ascertain as to where the lessons learnt can be applied? Do you understand what caused the problem and how it was solved, or where and how the opportunity was capitalized on? Anticipating – how good are you at being able to replicate or avoid the lessons learnt? For example, if you are an engineering consultancy who tried to enter a new market unsuccessfully then can you identify why? Was it the lack of a local partner? Cultural differences? Inability to deliver? These 3 factors apply equally to the individual as to the business. For real success you need resilience both personally and corporately – if you lack the resilience you may not survive the change, even if the business does. Resilience is not about just meeting the current challenge, or having met the challenge just past, but it is about putting yourself in a better position for the future – not just going back to your original shape or form before the challenge occurred. 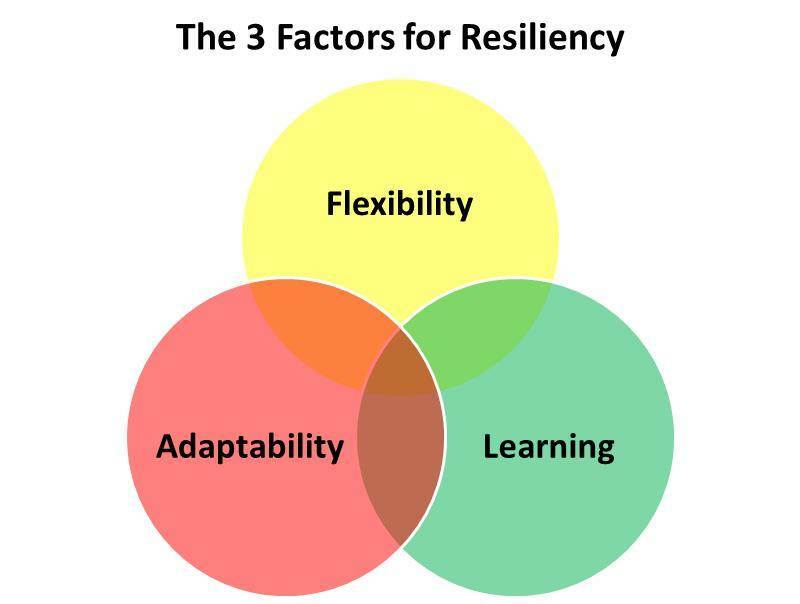 To be resilient you need to be flexible, adaptable and to learn from your experiences. So what does it mean if you only have two out of three, let’s see below. 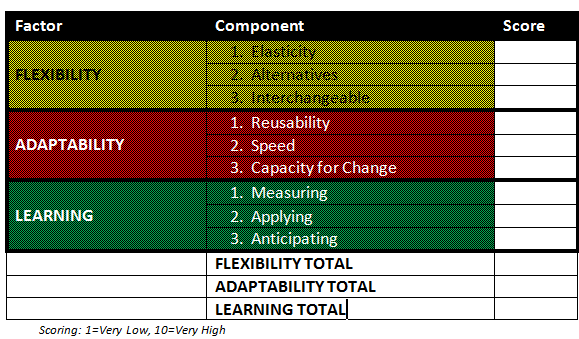 Adaptability & Learning – you can diversify into other areas, but you are not at the forefront of your market being weak at delivering in alternative ways. You are at risk of being out-maneuvered by competitors and being a market follower rather than a leader. Learning & Flexibility – you are efficient at operating in your particular niche, but you are a one-trick pony, and you are at the whim of industry pressures. You are more reactive than proactive, and your ability to become diverse, grow and spread the risk is weak. For each of the 3 factors, and for each of the 3 components for each factor, how do you rate yourself? Score yourself out of 10 for each component (1= Very Low, 10=Very High), and rate how strong or weak you are in each factor and relatively. Which are your strongest and weakest areas? How can you leverage your strengths to offset your weaker areas and reduce the associated risks and implications? Are you really as resilient as you thought? Sit down somewhere comfortable and preferably quiet. Let go of whatever is going on in your mind. Take a deep breath through your nose all the way into your belly, try not to breathe into your chest as you don’t breathe so deeply. Breathe out slowly through your mouth. Exhale continuously until you can’t exhale any more. Then breathe in again, and repeat the process four or five times. Open your eyes and breathe normally. Take the time to do this every day. You will find that by doing this you are not only more relaxed, but your mind is clearer and has less “chatter” going on allowing you to focus and concentrate on your work. Encourage your team to take brief breaks to do this, especially when they are very busy and not as productive as they would like to be. You can also help them to do this by building it into the start of your meetings – a good way to help people come to the meeting fresher, more alert and with the right intention. The Circle of Concern – this larger circle encompasses everything that you are concerned about, including those things over which you exert no control or influence e.g. the level of tax, terrorist threats, the current interest rate on loans and mortgages etcetera. We tend to waste a lot of our time, effort and mental energy in the Circle of Concern. This produces nothing as we are unable to overcome the inertia or have any effect. The Circle of Influence is smaller, and it encompasses those things that we can do something about. These are those things where we can be proactive and, by taking action for ourselves, address them. Here we invest our time, energy and effort on the things that we can change. This produces results and momentum forward. The two circles – Concern and Influence – are about the choices you make and the results you want. The Circle of Concern is where you find people who focus on that which they cannot influence. They are reactive, stressed and ineffectual. The Circle of Influence is where we find people who choose to focus on things that they can influence. By focusing attention and energy on our circle of influence, people are increasingly proactive. The energy we expend is enlarging; each small victory motivates us further exert influence. We don’t waste energy on things we can do nothing about, but direct it towards what we can change. With each step we feel stronger and more creative. And so our circle of influence expands. By focusing on what we can influence we also start to understand better what we cannot influence. We develop a better understanding of our circle of concern, and what it includes and does not include – it may even expand our circle of concern. This provides us with a fuller and better appreciation of the context in which we work, and helps us to better focus on our efforts on what we can influence. It can be incredibly liberating to realize that, in choosing how to respond to circumstances, we affect those circumstances. If we want to cope with the challenges we face, then we need to learn how we can influence them. 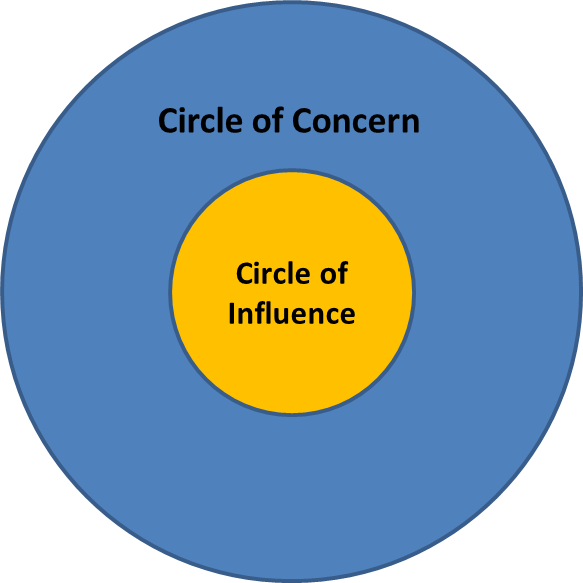 Share this diagram with your team, colleagues, and clients to help them distinguish between the two, what lies within their Circle of Influence whilst being aware of what lies within their Circle of Concern – and to focus their efforts on what they can influence, not that over which they have no control. This will provide greater traction, reduced stress and a more effective and productive team who can achieve results more easily. There is a simple, but useful tool that helps you to understand how people respond to situations, and to anticipate their likely behaviour. It can also help you identify those who are likely to be winners and losers. This tool is called the Locus of Control. Everyone wants to know what separates winners from losers. One of the significant factors limiting the attainment of your vision is the degree to which you believe you are in control of your destiny. Your locus of control can be internal or external. You can have a combination of both but normally one will outweigh the other. So what are the differences between an internal Locus of Control and an external Locus of Control,, and how can you identify them? External Locus of Control – you can tell by listening to what you say, or your team members, when talking about your business and your life. If you hear things like, “I would have been successful but the economy turned sour” or “I got caught by a pile of bad debts so I had to close the business down” you have an external locus of control. People with an external locus of control blame the external factors for their failure. Internal Locus of Control – people with an internal locus of control feel that they can influence the issues around them. You’ll hear them say things like “I misjudged the market so I put on too many people which ended up costing me a packet of money” or “I found that my skills weren’t sufficient to handle the negotiation”. Get into the habit of listening to the people to determine whether they have an internal or external locus of control. Of course, those who have an external locus are the ones who find it difficult to change. It’s always someone else’s fault or responsibility. If you are setting up a team or looking at staffing make sure you have plenty of people with an internal locus of control. In simple terms, a person with an external locus of control is problem focused, while a person with an internal locus of control is solution focused. Remember, you will always find what you are looking for. Sometimes you find that by teaching someone about the locus of control, and helping them to change their own mindset they can change from having an external locus of control to an internal locus of control. There is little point in developing a focused and aggressive business strategy if you are surrounded with people who believe that the Government, their people and even their customers are conspiring against them. You are defeated before you start. How can this be resolved? By having people with an internal locus of control! To see or download this blog as a PDF article click here. Often, when we take time to reflect, we ask ourselves passive questions rather than active questions i.e. what has been done to change us, not what we have done to change ourselves. “Do you have clear goals?” is an example of a passive question. It’s passive because it can cause people to think of what is being done to them rather than what they are doing for themselves. When we answers such static questions our response is environmental – that is we attribute the reasons for this answer to external factors, not ourselves. This encourages us and others when answering passive questions, to abdicate responsibility and accountability for ourselves. It also means that what we address, as a result of the responses we get from asking passive questions, will not help us address what we can do to improve. In the video below Marshall Goldsmith provides an overview of how you can use active questions to improve yourself. Simlarly, your team can use them in turn to improve themselves. Active questions are the alternative to passive questions. There is a huge difference between “Do you have clear goals?” and “Did you do your best to set clear goals for yourself?” The former is trying to determine the employee’s state of mind; the latter challenges the employee to describe or defend a course of action. Here They Are: The Six Questions that Will Set You Up to Be Super Successful! My challenge to you? Try it for yourself and see! If you like, try this for 2 weeks and then send me a quick note and let me know how it is working for you. I can’t wait to hear from you!